Setting up Data Guard is a regular practice for DBAs to ensure their environments are able to withstand a disaster. 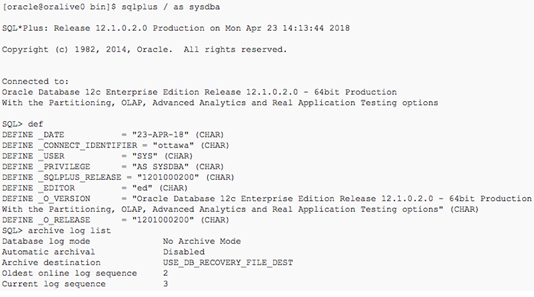 Data Guard is a standard feature with Oracle Enterprise Edition. 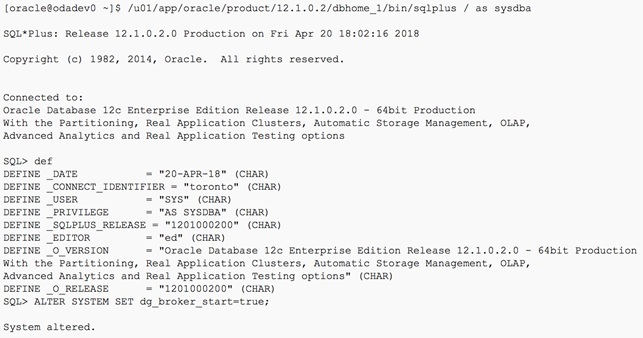 This blog lays out all of the steps necessary to configure Data Guard between two Oracle Database Appliances plus test the configuration with a switchover. 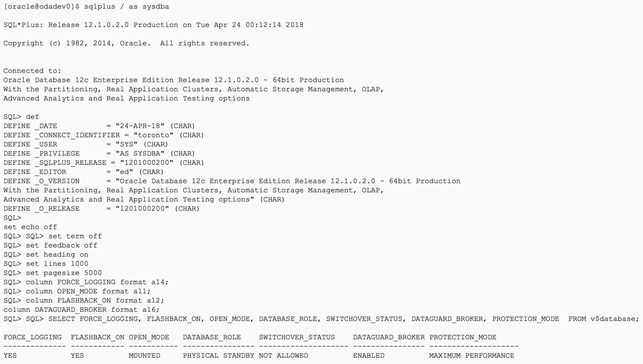 This is a Data Guard set up on an ODA X3-2 Bare Metal configuration using ASM storage. Two ODAs are used for this configuration. ODALIVE and ODADEV, both X3-2. 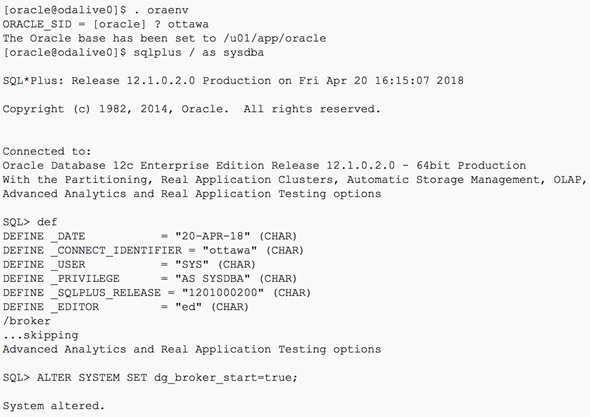 Confirm whether archivelog mode is enabled on “ottawa” on DB ODALIVE0. 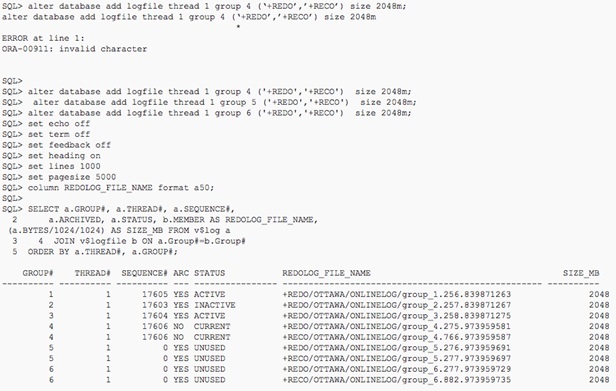 Verify that the ottawa primary database is running in ARCHIVELOG mode. In this case the “ottawa” database is in noarchivelog mode, so we need to do the following to switch to archivelog mode. 2. Enabling FORCE LOGGING mode. 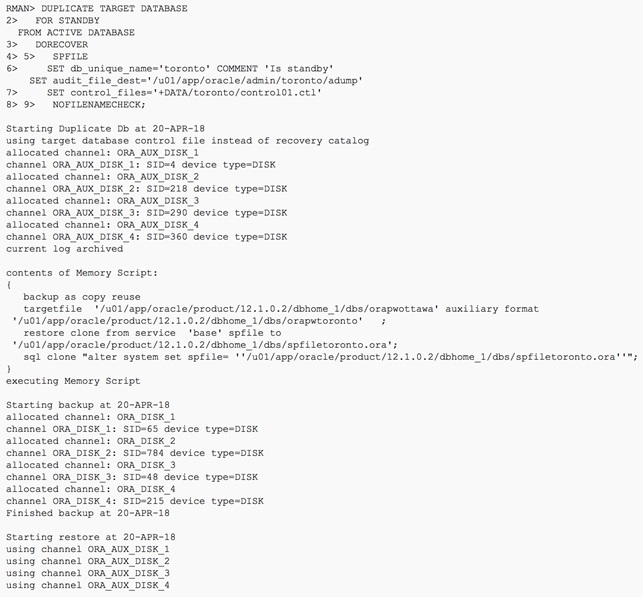 Force logging ensures integrity of your standby database. 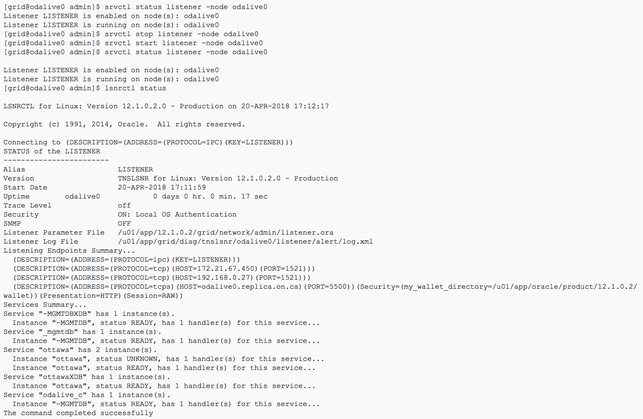 Verify if FORCE LOGGING is already enabled on your primary database. 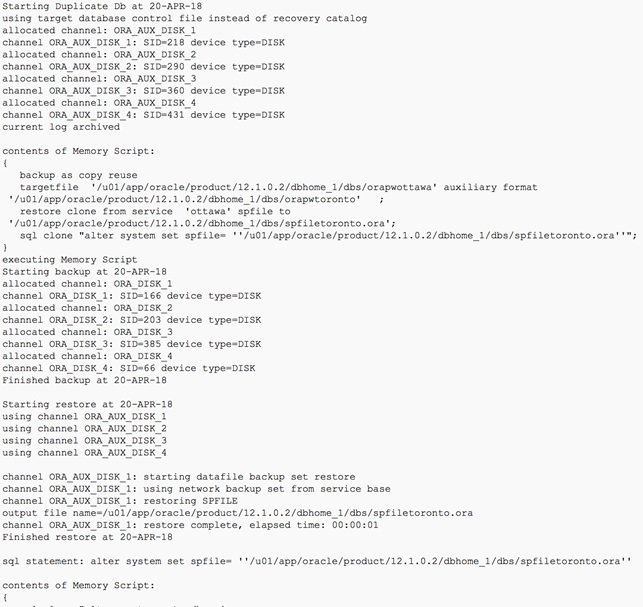 If force logging is disabled as in the above it has to be enabled for the dataguard process as follows. Configuring the flashback database feature on the primary database removes the need for recreating the database after a failover operation. It can simply be flashed back to a point in time just prior to the failover. Here, it is disabled so it has to be enabled as follows. 5. Consider multiplexing redo log files. 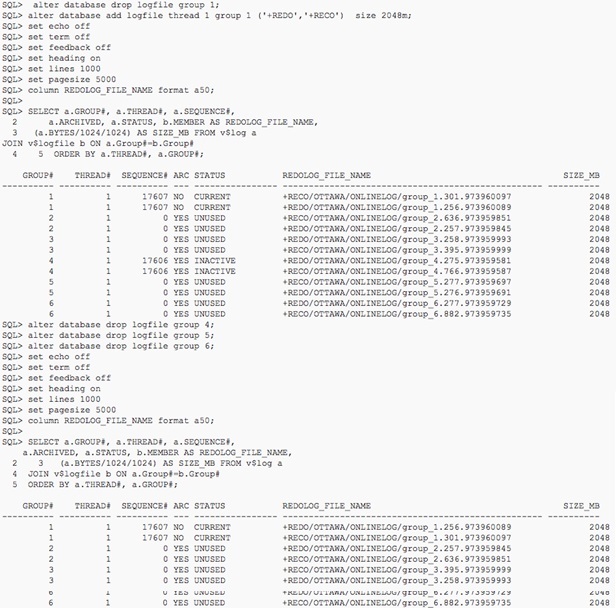 We can take the opportunity to multiplex our redo log files. To keep the group arrangement orderly in this scenario, we need to create additional log groups, drop the existing ones and then ensure your desired number of groups remain. In this case, we would like to have one member per log group spread across +REDO & +RECO disk groups. Our intention in this case is to keep 3 online redo log groups. 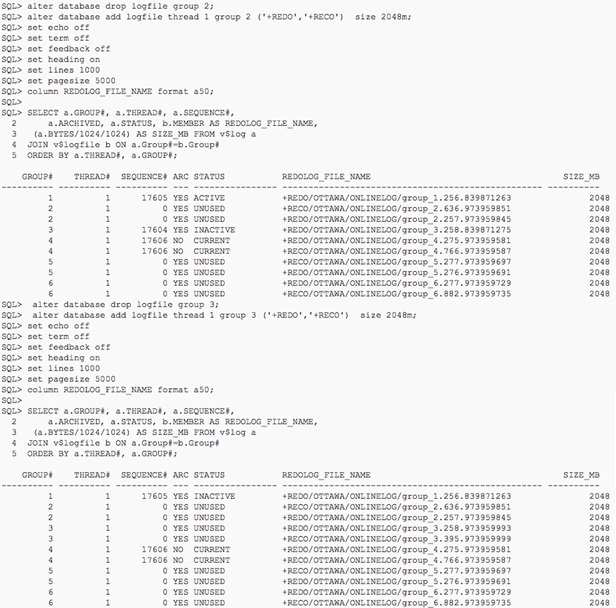 Now it is time to drop the non-multiplexed redo log files and replace with multiplexed redo logfiles. Before we do so, we need to check whether the log group we want to drop has the attributes of “ARC=YES” and “STATUS=INACTIVE” or “STATUS=UNUSED”. We need to run the sql below to force a log switch and change the log status as indicated previously. 6. 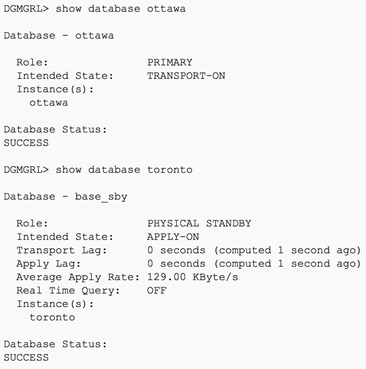 Create Standby Log Files on OTTAWA Primary. The standby redo log groups must contain one group more than exists for the online redo logs. 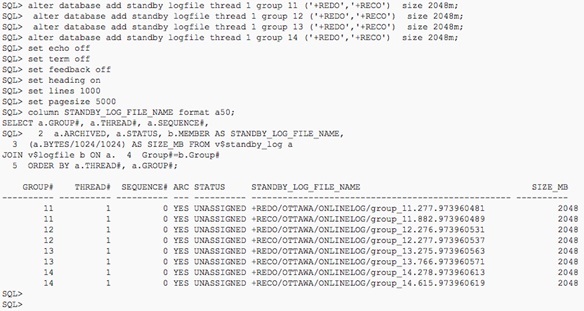 You can confirm standby log creation with the below SQL. When the primary database adds or drops a datafile, the corresponding action should also be automatically taken on the standby database. This operation can be enabled using automated standby file management. Oracle Net Service Names must be configured to enable redo transportation across the databases. Update tnsnames.ora file to include the TNS alias for both primary and standby databases. 9. 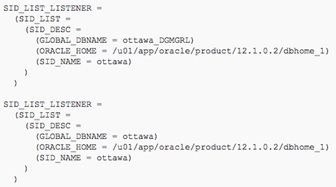 Set up the listener.ora files for “ottawa” DB to include entries for the Dataguard broker. 10. Restart listener on ODALIVE0 as “grid” user for changes to take effect. 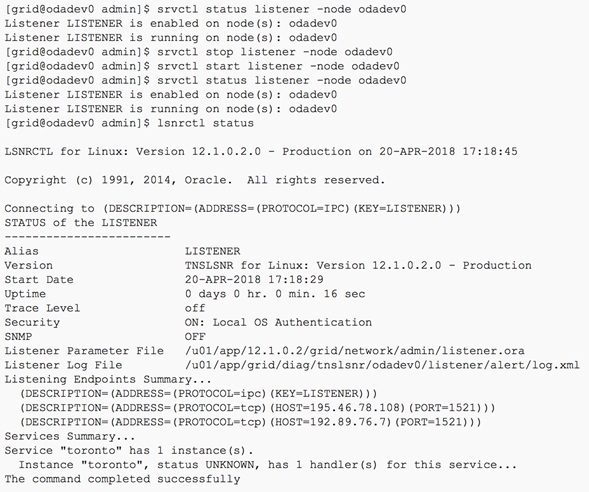 At this stage, Oracle Net should be able to resolve the TNS aliases for both the primary and standby. 14. 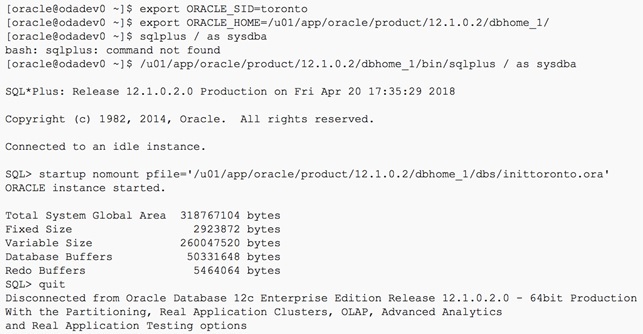 Set up the listener.ora files for “ottawa” DB to include entries for the Dataguard broker. 15. Restart listener on ODADEV0 as “grid” user for changes to take effect. 17. 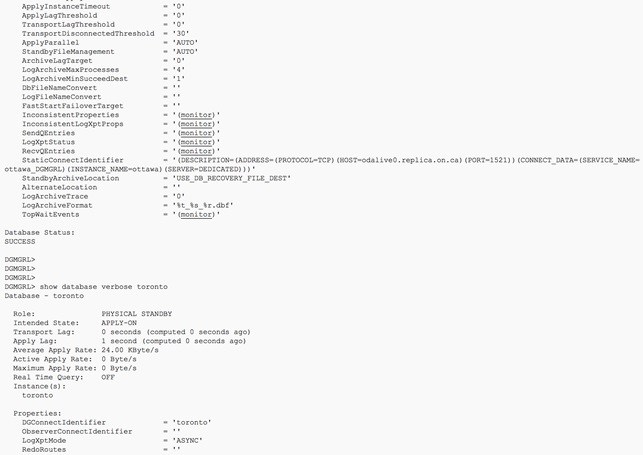 Creation of pfile on ODADEV0 for “toronto” DB with the following contents. 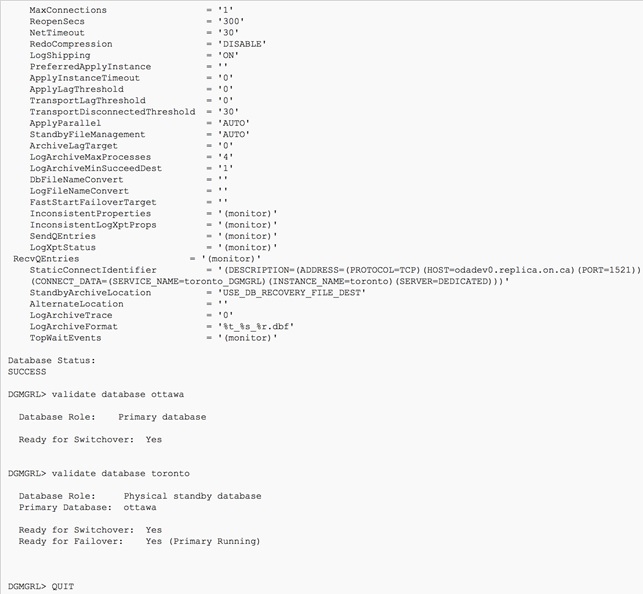 Compare with the pfile of the primary database and make note of the locations of the datafiles, audit trail and controlfile and ensure the relevant directories exist on the standby DB server. 19. 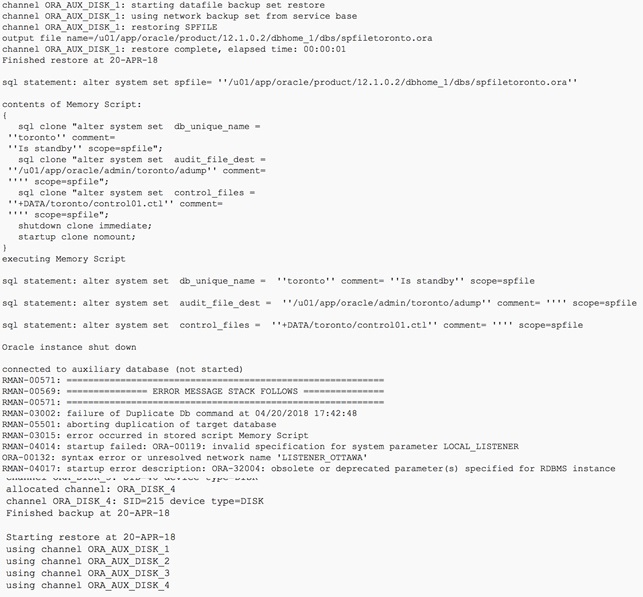 Create directory in +DATA in ASM ON ODADEV0 for the control file. 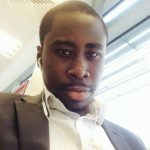 Ensure that you are using the same sys password you use for the primary DB since we have already copied over the password file from the primary DB. The error in the attached is requesting for a proper definition of the “LOCAL_LISTENER” parameter defined in the spfile automatically copied from the primary DB. 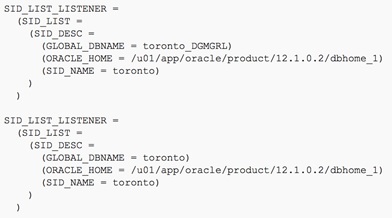 Since we are on the “toronto” db, the parameter must be adjusted accordingly in the duplicate command. 29. 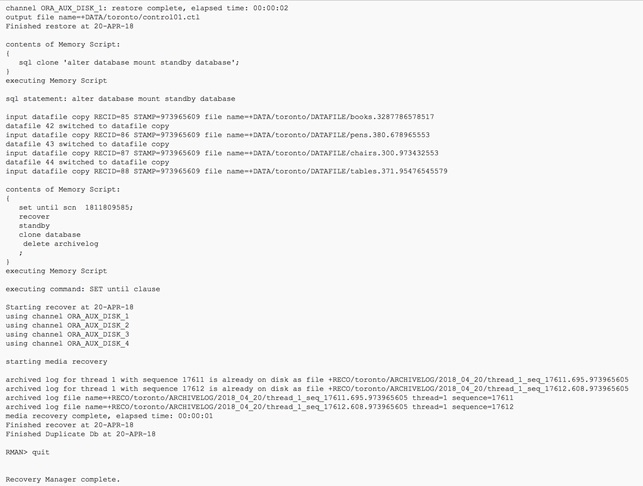 Configure archive log deletion policy on primary DB RMAN. The state of the primary and standby databases areTRANSPORT-ON and APPLY-ON, respectively. All participating databases are in good health, without any errors or warnings present. 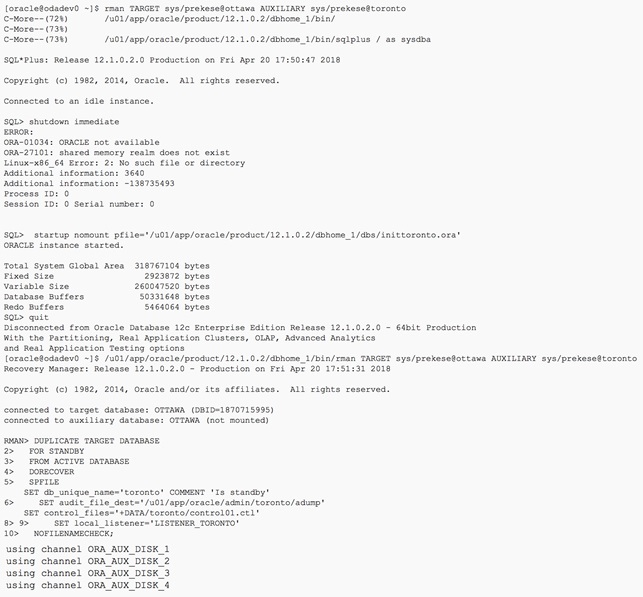 Standby redo log files on the primary database are set up, and theLogXptMode configurable database property is set to SYNC if the configuration is operating in either maximum availability mode or maximum protection mode.